Light, portable and perfect for street photography and general picture-taking on-the-go, compact system cameras feature the flexibility of manual controls and interchangeable lenses, but it hasn't always been possible to make the most of filters with them, until now. 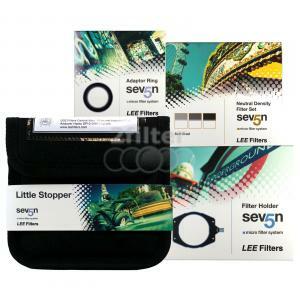 Comprising a lightweight, precision engineered filter holder, the LEE Filters Seven5 Micro Filter System is compatible with LEE's 75x90mm filter range, simply select the correct adapter ring for your lens thread, screw it onto the lens, snap on the filter holder and drop in the appropriate filter. In just a few moments you're ready to shoot. The LEE Seven5 Little Stopper is a 6-stop, solid ND Filter (75mm x 90 mm). The LEE Little Stopper reduces the amount of light entering your lens by six F/stops. By greatly extending exposure times the LEE Seven5 Little Stopper has the effect of allowing anything that is moving in your image to become blurred or ghost like, for example clouds, waterfalls, rivers, and the sea. The LEE Little Stopper filter can also be used on cityscape to blur people or on roads and motorways to blur traffic. At six stops, the Little Stopper is ideal for those low-light conditions at the beginning and end of the day (when the Big Stopper's ten stops may prove too much), allowing you to enjoy increased flexibility with exposure lengths. In many shooting conditions, this means that detail and texture in areas of movement such as the sky and water would be retained, while still conveying a sense of time passing. LEE Filters Graduated Neutral Density filters help all cameras record scenes more like we see them - with a broad tonal range that's lost if not captured in the moment. As a general rule, a soft grad would be used for any setting that has a deviated horizon line, such as mountains, trees & rock formations. A soft grad reduces exposure without affecting color balance. LEE Filters Neutral Density Grads can be stacked together so you can respond to almost any lighting situation. The filters for the Seven5 system are manufactured to the same standards as those for the renowned LEE 100mm system. Made in a way that meets the company’s exacting quality control in color and optical flatness, products in the LEE Filters range have become the benchmark by which other systems are judged, and are the indispensable tools of many photographic professionals worldwide.